Vastator's road to heavy metal recognition has been a long one. The Chilean band was born in 1986, released some EPs early on, but only found recognition beyond their borders at the turn of the century. Machine Hell, on France's Inferno Records, is their fourth full-length work. Vastator's roots are self-evident: early old school metal, more New Wave of British Heavy Metal merging with American speed metal. Machine Hell and X-Terminate sound like Iron Maiden after a cocktail of Red Bull and Jaeger. Yet, another song, Fiend, paces differently, and could have been found on a early Maiden album like Killers. Vocalist Sr. Diaz also has Dickinsonian style on that same number, but mostly his method is indeterminate. I'm not sure if he wants the range of a Bruce Dickinson, or simply to be a screamer (like Halford on steriods), which seems to be the case on many songs. Yet, it works. As do the skills of the rest of the band: the rhythm section is sterling and steady, and the lead guitar work quite fiery. Combined with the surprisingly crisp production, Machine Hell displays the depth of those skills. Hawker Hunter, with "Metal" Mike Chlasciak on lead guitar, is a fine example. Note should be made that the first seven songs are in English then, beginning with Combustible en la Sangre, the last songs are in Spanish. Also included is a bonus video for The Gods Give No Reply. There's no mistaking that Machine Hell is organic classic heavy metal, steady at times, but mostly ramped up and full throttle for headbanging pleasure. 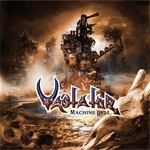 There's no mistaking it: Vastator's Machine Hell is organic classic heavy metal, steady at times, but mostly ramped up and full throttle for headbanging pleasure.